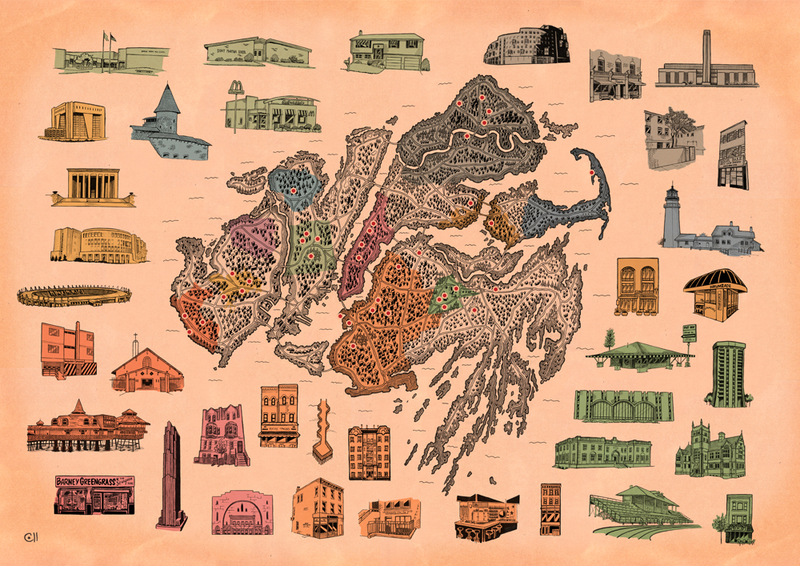 Last year I was contacted by a client looking for a very special birthday present; a map of a fictional city made of meaningful places for her boyfriend and for them as a couple. 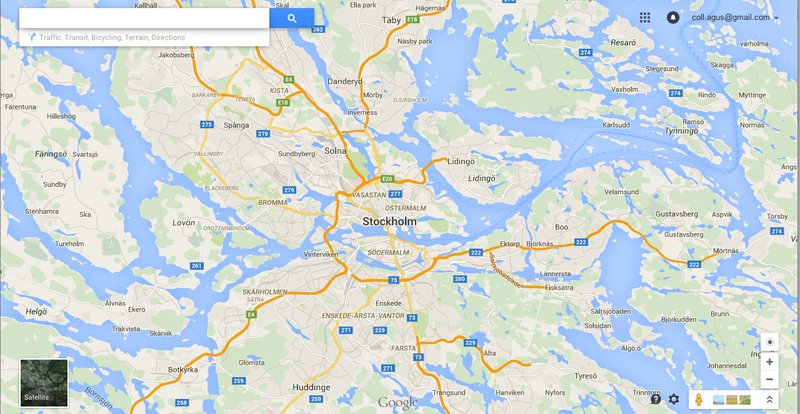 Almost like a biographical map. What you see here is the result of hours of hard work, research and intense client-artist feedback cemented on an A2 print, made of several hand-drawn and very detailed inked drawings which were coloured and pieced together using computer software. The idea, although daunting at first was soon followed by awe. What a great chance to create something I had been toying with for a long time, designing a completely made up town from scratch; not fanciful but bound by a pre-defined set of rules and a relative logic. The process would be long and slow but a method was eventually developed successfully and can now be used in similar commissions. After an initial geographical brainstorm, the landmark list was narrowed down to the most symbolic. The next step had the client supplying screen captures of maps which I then isolated and turned into puzzle pieces. I juggled with these for hours during one of the most intense parts of the process until I came out with the first few roughs of the map. Because of the variety of landmarks mentioned –towns, cities, states and whole countries– I had to find a foundation to begin building on; a place that helped merge all these seemingly random places together. Not because it was a requirement but because I wanted to create something one would look at and think real until closer inspection. Then the map would slowly reveal impossible connections between real locations thousands of miles apart from each other. Almost like a geographical Frankenstein. 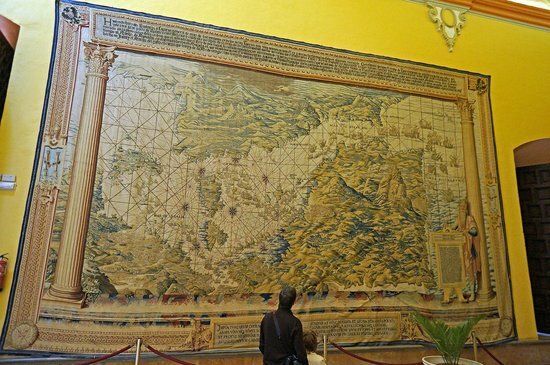 At this stage I was looking at old maps, from early depictions of American land woven on tapestries hanging from the walls of the Royal Alcazar in Seville to Victorian maps travellers could buy at train stations. 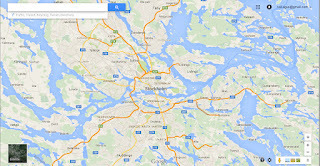 Most of the landmarks were coastal or had rivers nearby and all that water and urban pockets made me think of Stockholm, which I visited a few summers ago and absolutely loved. 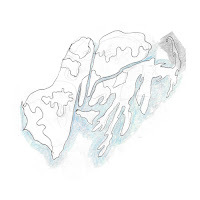 An archipelago city, a system of islands and interconnected waterways where there is room for big chunks of developed land and road transportation – unlike a purely water-based city, like Venice for example. With that in mind I chose New York's Manhattan island as this city's centre and basing on its surroundings I built around it, piecing in all these territories intuitively or in a way that made some sense visually. Once the jigsaw was completed I then followed with planning urban patches and roads, which are based on real infrastructures. All around it are the drawings of buildings they have lived in, studied, worked or that bear a deeper meaning. These are colour-coded and relate to the shapes on the map which mark boundaries of the places referenced. The map is intended to open up its meaning slowly, and most importantly to the client's close circle. However, I want to think that some of these landmarks are common to anyone well-traveled and hopefully it will also make sense to those outside this particular world. The realism of the map is questionable but I like to think that it challenges our knowledge of how nature works. It would be interesting to have a geologist challenge its organicity and confirm wether or not is blatantly man made. Interestingly though, the map bears an old feel that gives it a certain legitimacy.